Campaign supporters have told us that Norfolk & Suffolk NHS Foundation Trust (NSFT) has appointed Tribe PR and Andrew Stronach Communications to help it with its PR at a cost of thousands of pounds even though NSFT has its own Communications Team. 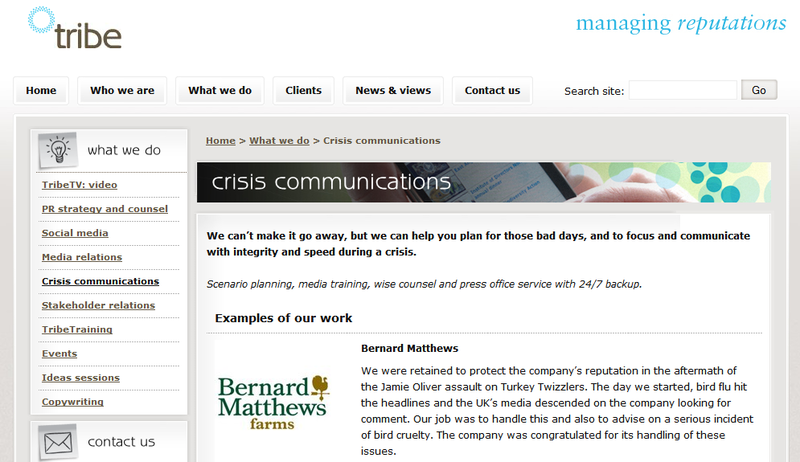 The Tribe PR website outlines the company’s skills in ‘crisis management’ as part of its business of ‘managing reputations.’ We thought NSFT believes that there isn’t a crisis. We were retained to protect the company’s reputation in the aftermath of the Jamie Oliver assault on Turkey Twizzlers. The day we started, bird flu hit the headlines and the UK’s media descended on the company looking for comment. Our job was to handle this and also to advise on a serious incident of bird cruelty. The company was congratulated for its handling of these issues. Is NSFT the Bernard Matthews of the NHS? Is the radical redesign the Turkey Twizzler of mental healthcare innovation? Is the Campaign to Save Mental Health Services in Norfolk & Suffolk Jamie Oliver? Pukka! In Tribe PR-speak, has the meaning of ‘assault’ changed from ‘make a physical attack on’ to ‘tell the truth about a product or service in the public interest’? Is the disastrous redundancy programme the bird flu epidemic? What’s the animal cruelty? Is it the loss of the Section 75 agreement, the dire NHS staff survey, the crisis team crisis, the bed crisis, the community team crisis, the impending financial deficit, the CQC failure or something else? There are so many candidates to choose from. None seems a perfect fit for playing baseball with poultry. Wasn’t the outcome that consumers abandoned Bernard Matthews products and that Bernard Matthews abandoned manufacture of Turkey Twizzlers, moved its production back to the UK at huge cost, made years of losses and sacked it CEO? Wouldn’t public money be better spent as intended on providing decent community services and local beds for the needy and vulnerable rather than on expensive spin from external consultants? SO…..let’s get this straight. NSFT spent £116.000 on a financial director for six months. Someone who approved the over spend on redundancies by £2.5 million. Then they spent £50,000 on a tax avoidance accountant over two years,and have hired a lawyer to fight negligence claims costing another £50,000. So, in order to make themselves NOT look totally incompetent they have hired a PR company. Makes perfect sense…….I can only wonder what the new CEO will make of this. “NSFT has its own Communications Team” – you’ve got to be joking! The “communications team” is a joke – incompetent amateurs! Their idea of working with the media is sucking up to the local rags! I know how much Tribe PR will be charging for their services and it’s not a low figure! Perhaps there’s an even bigger skeleton waiting to come out of the trust’s cupboard? I just hope these two companies know what they’ve let themselves in for by hitching up to this bunch of numpties! Not sure what happened to Tribe PR. Perhaps they realised what a bunch of no-hopers they’d latched on to and decided the reputational risk to themselves was too great? Anyway, this morning on NHS Jobs, the splendidly inept Comms dept (Keystone Cops only without the snazzy wheels) advertised for a Head of Public Affairs at around £40k, an Internal Communications Manager (£40k), Events Manager (£40K), and Head of News (WTF???) at £25K. By this evening, all four jobs had been withdrawn. The words p*ss-up and brewery spring to mind! It seems the pointless and corrupt directors are more interested in public relations than actually treating people with mental health issues! And in a further development (linked – surely not!) NSFT is today advertising for a Head of Comms. Who’d want that poisoned chalice? Oh it’ll be some crony of the board who’s already been lined up. It’s how these people work – not a speck of decency between them! Cynical and corrupt to the core! So, that’s £20,000 spent for a couple of months work, despite having a highly paid Communications Team in house. Is this good financial management?